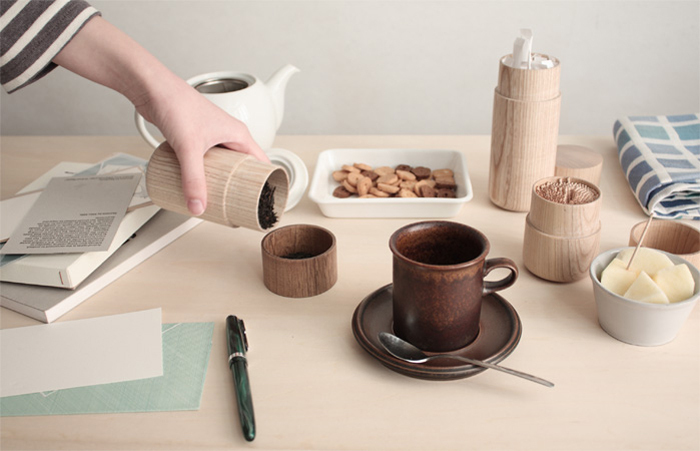 I love these beautiful wood vessels. I've always wondered how raw wood does not soak up all food colors and juices, or does it? Or are these lightly finished with something? I may never know, I think the site is in Japanese. Maybe it's a special kind of wood? Love them too! I've always wondered that too! As much I love the look of wooden dishes, I could never bring myself to buy them. It just seems too impractical. It is most likely sealed with a food grade wax or oil to repel water. Like what they put on butcher blocks. they are gorgeous...i too wonder about the absorbing of food oils etc. Hm...good question! They sure are beautiful though. The website says they're finished with polyurethane. they are not made for "wet" food. see how they only have dry items in them? If the containers arn't finished dry goods would be the only safe items, unless the substance being held is made of iron (it'll stain some woods black). I would hope they arn't using polyurethane, there's many other finishes that are food safe (consumable from can). Some types of wood are actually antibacterial. Lots of chefs recommend wooden cutting boards for that reason. And teething toys for babies are often made of these kinds of wood. Little Sapling Toys use walnut, maple and cherry wood, for instance. Thy put a bees wax or jojoba finish on thir toys, i think. Hope this helps.